As you emerge from the subway on a warm spring evening and head towards Deoksugung Palace you begin to feel as though you are going back in time. The hustle and bustle of the city melts into the background as you follow the winding Deoksu(gung) Palace Stone Wall, retracing the steps of countless young lovers. After a short 10-minute walk you arrive at the Chongdong Theater. Surrounded not only by the palace but several of the more prominent museums of art and culture in the country, this is one of the most historically important areas of Seoul. The Chongdong Theater is based on the Wongaksa Theater that was opened by Emperor Kochung in 1905. Wongaksa was very significant because it offered the first large-scale live showings of traditional Korean performance art. 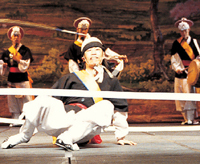 The Chongdong Theater offers the same type of performances, with the goal of introducing foreigners to Korean culture. Hyung-sik Park is director of the theatre. He cuts a striking figure seated proudly behind a large desk, surrounded by his labor of love. A perfectly tailored suit and shiny silver hair combine with the graceful movements of an orchestra conductor to make an immediate impression upon those who meet him. A self-described artist, he became involved in the business aspect of the industry while working as a performer at Sejong Center for the Performing Arts. 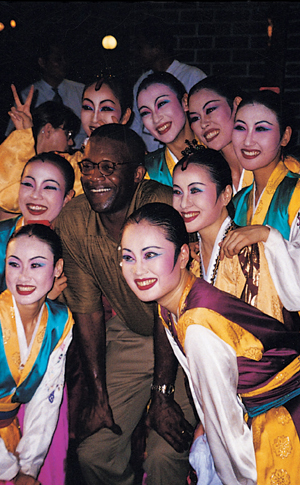 During his successful career as a baritone he began doing administrative work at Sejong and quickly worked his way up the ladder to the chief of the performing arts division. He moved to his current post at Chondong in March of 2000. My friend from New Zealand was visiting me in Korea in 1997,explains Mr. Park,"He wanted to experience a traditional Korean cultural performance but there was nowhere for him to go. At that time I realized we needed an outlet to show foreigners the beauty of my nation's culture." After government funding was made available to restore the old Wongaksa venue, weekly shows were offered to the general public. The theater also made extensive efforts to reach out to young Korean people, with public school students from all over the country brought in to watch the live show. When Mr. Park arrived in 2000 he decided to make the performances available on a daily basis, and thus more accessible to short-term visitors of Seoul. The daily show provides the essence of the four major genres of traditional Korean performing arts: dance, instrumental music, songs, and the furious Samulnori percussion presentation. The highlights are so numerous it's impossible to list them all, and words cannot do justice to the incredible performances on stage. In the Royal Court Ensemble, the featured instrument is the 12-string zither. Similar in fashion to a xylophone, the zither floats an eerily beautiful melody thorough the venue that causes the hairs on the neck to stand on end. The Buchaechum, or Korean fan dance, is a precision synchronized number that shows off the talents of the female dancers as they glide effortlessly over the stage in brightly coloured traditional costumes. The evening reaches a feverish climax as the Samulnori artists grace the stage. This performance is the foundation for more modern percussion-based stage shows such as Stomp and Korea's own Nanta. Starting off at a relatively slow pace, the beating of the drums gradually increases in intensity. Before long their movements are but a blur as the audience is mesmerized by the steady rhythm. A surge of energy rushes through the building as the drummers scream at each other in encouragement, ratcheting up the tempo even more. It is exhilarating to watch and many in the audience seem just as spent as the performers when the pounding slowly dies off to nothing. After curtain call the stars of the show parade outside to the courtyard. Here audience members join in the final dance, young and old alike, skipping and hopping in a gigantic circle. There are also opportunities for photographs and conversations with the performers. I've been working in Asia for 10 years and I've never seen anything like this! commented Ray, an American businessman in Korea who was able to take in the show last week. Although he is typical of the type of audience the theater wishes to attract, the mandate is also to reach out to the expatriate community. It is people like Jon Koplin, an American currently working for a Samsung company here in Seoul that Mr. Park hopes to attract on a more regular basis. I was very impressed by the show,offered Koplin. I'll be recommending it to all of my friends. The theater also offers special workshops for foreigners that lets them sample Korean food, learn to play the traditional instruments, as well as dress up in the authentic costumes worn by the performers. It is by offering these special activities that Mr. Park and his colleagues aim to expose foreigners to a special part of Korea they may otherwise miss. You can see the satisfaction in Park's eye as he summarizes why the Chongdong Theater is so important to him. "This part of Korean culture has withstood many onslaughts such as the Japanese occupation and World War II, said Mr. Park, "Throughout the years performers had the will and passion to continue and it is our duty to ensure it lives on for future generations to enjoy." Those interested in purchasing tickets for the show can do so at the website or by visiting the box-office located at the theatre. Grant Surridge studied business at the University of Manitoba in Canada. 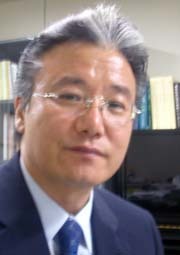 He serves as a staff writer for The Seoul Times.